Traditionally, Coinstar has dealt with transforming loose change into more manageable bills. More likely than not, most everyone has seen a Coinstar kiosk in grocery store or big box retailer, but in recent months, the company has been building more partnerships with online games and payment companies. 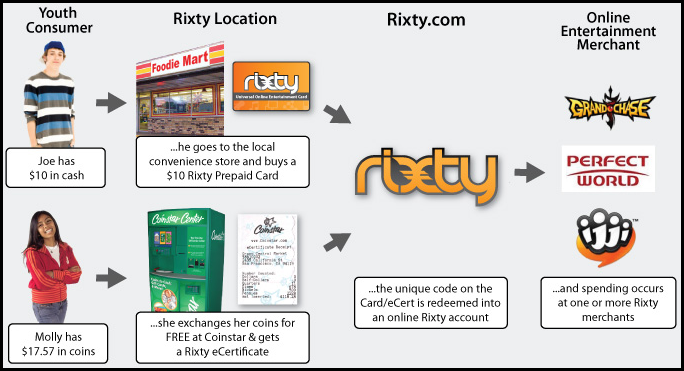 Back in April, Coinstar partnered with Rixty to create an alternative payment platform that turned loose change into “Rixty Cards” at Coinstar kiosks. These cards, the same Rixty cards you would see on rack displays, can then be used for the purchase of virtual currency within the Rixty platform. Furthermore, and more recently, Coinstar also delved into the realm of prepaid online gaming cards with partnerships with game companies such as Aeria Games, Spare Change, and Wild Tangent. These are new waters for the folks over at Coinstar, but we recently spoke with Wayne Waxman, Marketing Manager for the company’s E-Payment Services group, to take a deeper look into the company’s plans. [Inside Social Games] Thanks for taking the time to speak with us. First off, why is Coinstar getting involved in online games? [Wayne Waxman] We entered this space for several reasons. The online gaming market potential is exploding. It’s a high-growth category that really caters to a young demographic, specifically teens who may not have access to credit. According to Mercator Advisory group, an estimated $3.8 billion will be loaded on game and ring tone prepaid cards in 2009. This number has grown from the $2.8 billion that was loaded in 2007. This really is an exciting opportunity for us and for our retail partners. Prepaid gaming cards help drive repeat visits from the loyal gaming audience and the products’ low price points drive trial – pricing starts as low as $5 – and hopefully encourages adoption. [ISG] Entering into this market has meant a lot of partnerships. We alleady know of the partnerships with Aeria, Spare Change, Rixty, and Wild Tangent, but whom else might you have in mind? [WW] On the prepaid card side, we are always looking for new product offerings and partners that will help drive traffic to our retailers and increase their shopper’s overall market basket. This is true for all our categories including online games. [ISG] Let’s talk about Rixty for a moment: When we first saw the concept of turning change into virtual currency, it did seem logical, but very unorthodox. What sort of numbers and revenue are you seeing?